For me, a perfect eyebrow product should give me a natural looking result that stays in place, even when I touch my brows at a decent the price point. So, on my never-ending search for the perfect eyebrow product, I came across the Maybelline TOTAL TEMPTATION BROW DEFINER. The product description met my needs. 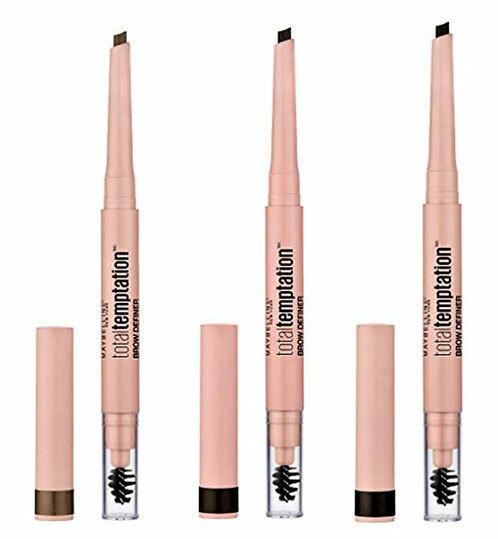 According to Maybelline, the TOTAL TEMPTATION BROW DEFINER has a unique teardrop tip that easily fills and shapes the brows for a full, softly defined look while the fluffy spoolie softly blends the product for natural-looking brows. 1. The "teardrop-shaped" tip is for sure one of the thinnest I ever used. This tip allows me to draw on tiny strokes to create a natural looking eyebrow. 2. The consistency of the Brow Definer is a dream. It is not to smooth and not too stiff. You can build up the product if you want to and the result is never cakey or unnatural just bolder. 3. The spoolie is perfect, especially for sparser brows. The tiny ball-shape blends the product instead of moving it to unwanted parts of my eyes as bigger spoolies do. 4. The staying power of the pencil is good. It doesn't wear off during the day even after a sweaty sports session. Although, I have to say I noticed a slight colour washing out effect after sports or at the end of a long day. Maybe a waterproof version of this pencil could fix the problem. The only thing I don't like about this pencil is the colour selection. Here, in Germany, the Brow Definer is available in 3 colours blonde, soft brown and deep brown. In the US you can purchase a fourth colour "medium brown". This limited colour range excludes too many hair colours like red- and dark-haired people. Therefore, I think the colour selection of the Brow Definer needs an extension. This is the best drugstore eyebrow pencil I ever used. I already recommended the Brow Definer to my sister and my mother. They love it, too. It performs better than most of the high-end products I tried out. Price-wise the Brow Definer is a total winner with under 10€. For sparse brows, the Total Temptation Brow Definer is one of the best eyebrow products I tested so far. This is a must-buy product if you can find a matching shade. By the way, I am using the Brow Definer in the shade "blonde". Maybelline New York is an American drugstore brand and part of the L'oréal group. 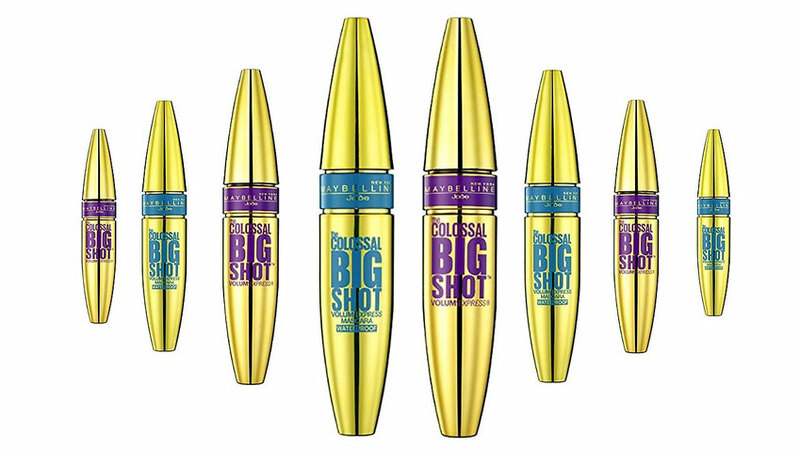 The Big Shot Mascara is the newest addition to their colossal mascara range. 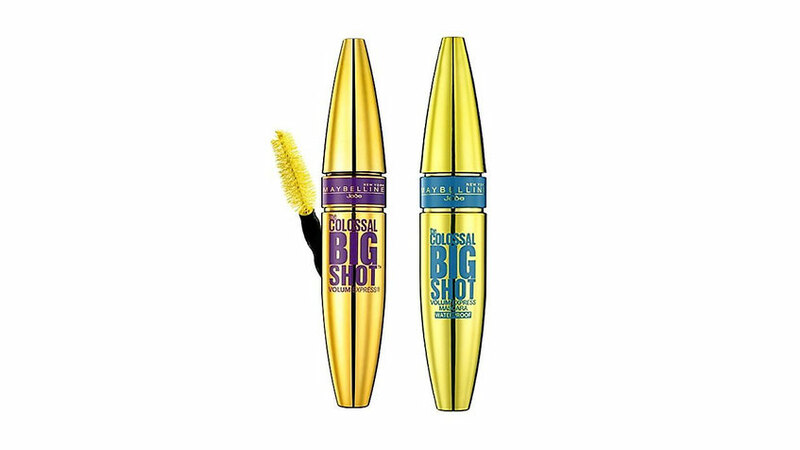 Like the original Colossal Mascara, the Big Shot comes in a yellow tube. Only this time it is a metallic yellow. The brush is medium sized and has waxy bristles. The Colossal Big Shot Mascara comes in a washable and waterproof version. On the US Market Maybelline released three new shades with the Youtube Beauty Vlogger Shyala Mitchel. These shades are Poppin' Purple, Baddest Black and Boomin' in Blue. I haven't seen them in Germany so far. The price varies between 7.99 and 12,99€. According to Maybelline, it is a volumising mascara, which gives bold lashes in one coat. The concern claims 8 of 10 users saw bigger bolder volumised lashes. 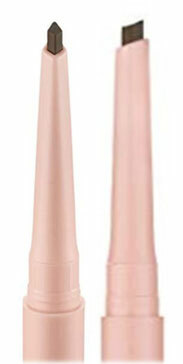 Maybelline recommends applying the mascara from root to tip for dramatic volume. This how I and probably all of you apply mascara, so nothing new on the mascara application front. For me, the most important part of mascara, next to the performance, is the brush. The brush of the Colossal Big Shot Mascara works like a charm. It covers all lashes with just one coat. There is never too much product on the brush. Probably due to the waxy bristles, the mascara doesn't get dry and clumpy after two or three weeks of use. Performance-wise the product holds its claims. It gives an impressive volume with just one coat. If I apply several coats, I almost get a false lash effect. I have the waterproof version. It stays on the lashes all day even if I cry. There is no need for a fresh-up during the day. The Big Shot Mascara doesn't fade a bit. I already have and will repurchase the Colossal Big Shot Mascara. I highly recommend the mascara for all of you who like to get bold lashes with just one stroke. 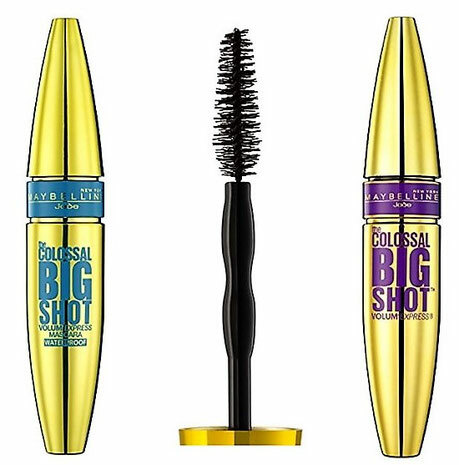 Have you tried the Colossal Big Shot Mascara yet? 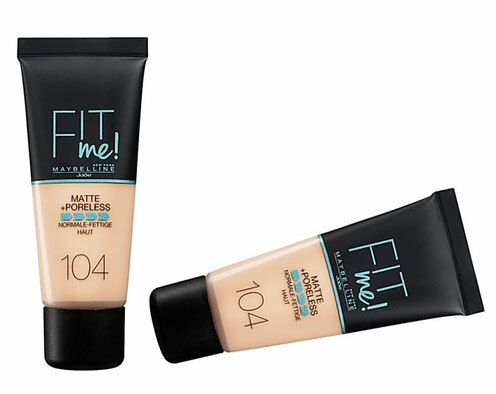 On my never-ending hunt for the perfect foundation, I put the Maybelline Fit me! Matte+ Poreless to the test. Here are my thoughts. The Maybelline Fit me! 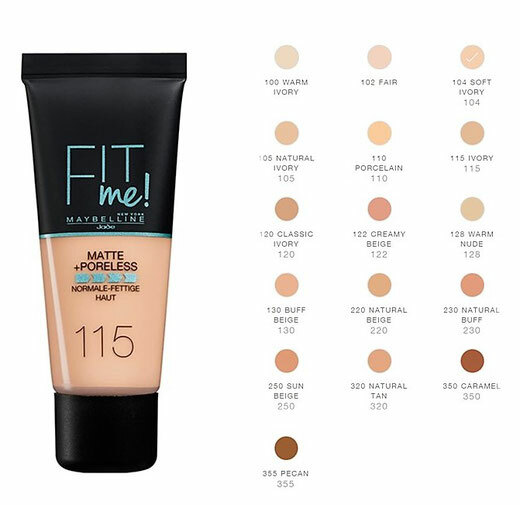 Matte+Poreless Foundation is another product from Maybelline's FIT me! line, which includes several foundations, concealers, blushes, bronzers, powders, and other makeup products. Unlike the Fit me! Luminous+Smooth Foundation which came in a glass container, the Matte+ Poreless comes in a squeezy tube. I love squeeze tubes because I can cut them open and use up every little drop of the foundation. Here in Germany the Fit me! Matte+Poreless Foundation comes 16 shades. The colour range starts with 100 and ends with 355. It comes with warm, cold and neutral undertones. The higher the number the darker the shade. Unfortunately, the colour system changes from country to country. If you are a 120 in Germany, it doesn't mean you are the same in the UK or US. Another difference is the colour range. It is much wider in other countries than Germany. There are 32 shades available in the US and 19 in the UK. According do the product information the Maybelline Fit me! Matte+Poreless is a lightweight foundation which mattifies and refines pores while giving the skin a natural, seamless finish. It supposedly works best on normal to oily skin. The foundation has a very light slightly runny consistency. It is easy to blend into the skin, and it leaves no visible makeup lines. For the application, I tried a damped beauty sponge as well as different makeup brushes. Both methods worked equally good. Like I mentioned before, I have normal skin with a slightly oily T-zone aka combination skin and prefer foundations with medium to full coverage. First things first, this is not a medium to full coverage foundation, but rather light to medium. One layer of foundation leaves a light coverage on my skin which I can build up to medium, but I have to use at least a second layer to achieve a medium coverage. If you have acne or other more prominent skin issues, you'll need an additional concealer to cover them. Also, the finish isn't matte, like the product name is claiming, I love it. It is velvety and like promised in the product description larger pores look more refined. Even better, the foundation doesn't look like makeup on the skin, no matter how many layers I apply. Uneven skin texture looks almost photo-shopped. Leaving me with a flawless looking skin. On me, the foundation lasts all day. Touch ups in my T-Zone area aren't necessary 90% of the time. So, is the Maybelline Fit me! Matte Poreless my perfect foundation? No, it isn't. Will I repurchase it again? Yes, I will. Also, the coverage is just light to medium, I have and will repurchase this foundation because I love the finish. The mixture of the Maybelline Fit me! Matte+Poreless and my Urban Decay All Nighter Foundation comes pretty close to a perfect foundation. The combination of both gives me the coverage I want as well as a flawless looking skin. Do I use the Matte+Poreless Foundation on its own? I do, occasionally, but only with concealer to achieve a better coverage. You will love the foundation if you want to blur out uneven skin texture, to achieve a more flawless looking skin. Like claimed in the product description the foundation mattifies impeccably without looking dry. 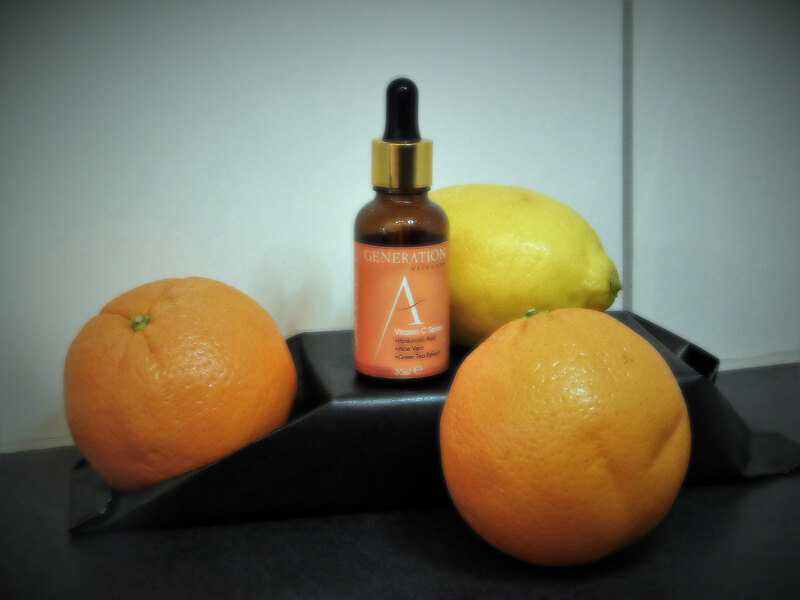 Therefore, it will work for oily, normal and combination skin. I hope this review was helpful? Here comes my first Product Review of 2017. I didn't notice it's been four months since I did my last one. However, I like to test new products a little bit longer to give you a thorough overview. 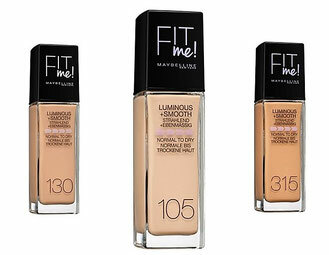 For the last three month, I put the Maybelline New York Fit me! Luminous+Smooth Foundation to the test. Here are my thoughts. Maybelline New York is an American drugstore brand and part of the L'oréal group. The Fit me! Luminous+Smooth Foundation is part of Maybelline's FIT me! line, which includes several foundations, concealers, blushes, bronzers, powders, and other makeup products. The foundation comes in a clear glass container with a black plastic cap. It contains 30ml of product and has a pump dispenser. The Fit me! Dewy+Smooth Foundation comes in 10 shades, with warm and cool undertones. The colour range starts with 105 and ends with 315. The higher the number the darker the shade. All shades with the end number 5 are suitable for cold undertones (pink, rose shades). The numbers ending on 0 work for warm undertones (yellow, golden). The price varies between 7,95 €-9,95 €. I got mine from here for 7,95 € . 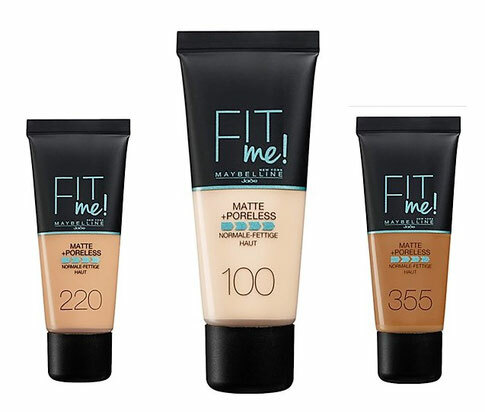 Maybelline renamed the foundation from Fit me! to Luminous+Smooth Foundation. 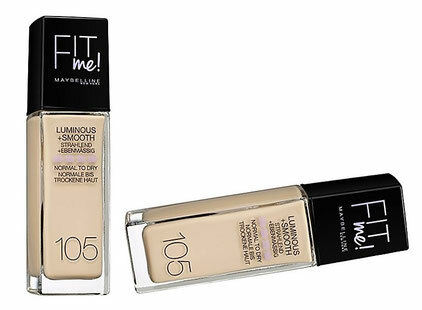 In the US, they sell it under Dewy & Smooth Foundation with a colour range of 16 shades. Furthermore, there are also products available which still carry the old label on their containers. 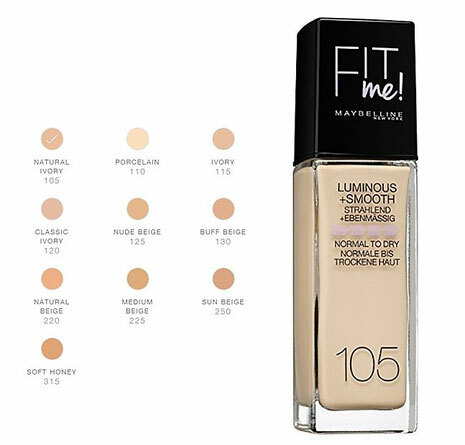 According to Maybelline, the foundation hydrates rough patches, smoothes the skin texture while blending seamlessly into the skin for an undetectable natural luminous finish with medium coverage. The foundation has a light consistency. It is easy to apply and blends fast into the skin. Maybelline recommends your fingers or an applicator to blend in the foundation. I used a damp beauty sponge as well as makeup brushes for application. 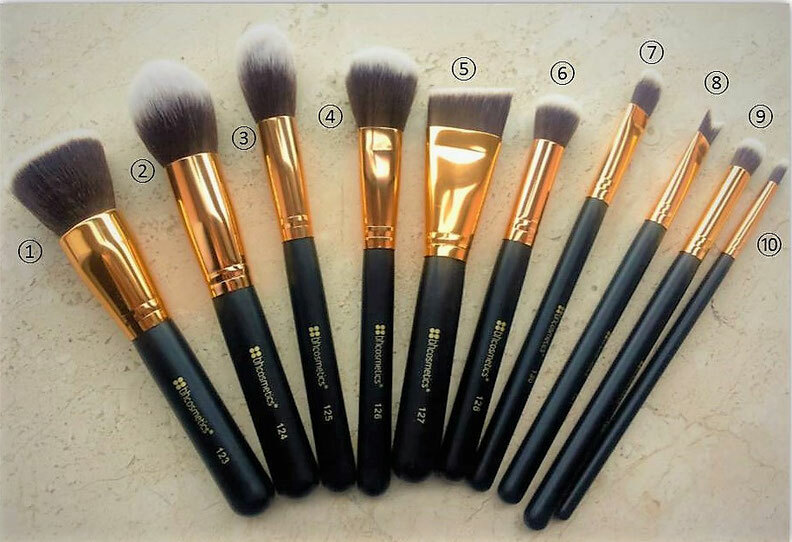 I prefer the beauty sponge because the finish is more luminous in comparison with a makeup brush. As some of you already know, I have normal to combination skin. Usually, I opt for foundations with medium to full coverage. The first thing I noticed after applying one layer of foundation is that the coverage is just light not medium. For medium coverage, I have to apply another layer. To cover blemishes or redness I have to use a concealer. The finish, however, is the bomb. It has a natural dewy finish. Just the perfect amount of glow for an everyday makeup look. Like promised in the product description, the foundation doesn't accentuate any kind of skin texture. On me, the foundation lasts all day. At some point of the day, I need to touch-up around my nose, but I have to do that with almost every foundation. Would I repurchase this foundation despite its light to medium coverage? Yes. Here is why. 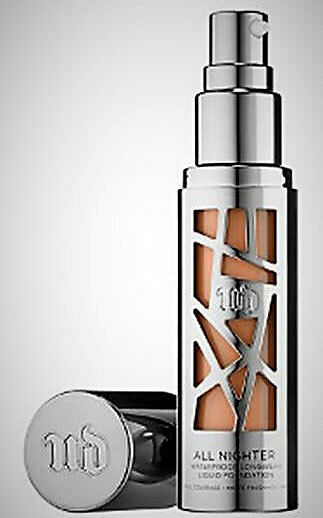 I love to mix the Luminous+Smooth Foundation with my Urban Decay All Nighter Foundation. The combination of both offers me the right amount of coverage and glow I am looking for on a daily basis. Do I wear the Luminous+Smooth Foundation on its own? Most of the time I don't. Nevertheless, I wear it almost every day mixed in with other foundations because I just can't get enough of its finish. You will love the foundation if you like a light coverage with a natural dewy finish. If you prefer more coverage, I highly recommend mixing the Luminous+Smooth Foundation into your other foundation. You will love the finish. For all of you with oily skin, this foundation might not the be the best choice, as it adds some extra glow to your face. For the last weeks, I put the Urban Decay All Nighter Liquid Foundation to the test to find out, if it could live up to its promising claims. The gunmetal coloured bottle has clear cutouts, so you can always check how much foundation is still left. It contains 30ml of product and comes with an airless pump. I am a big fan of airless pumps as they guarantee usage down to the last drop. The All Nighter Liquid Foundation comes in 24 shades with neutral, warm and cool undertones. The colour range starts with 0,5 and ends with 12,0. The higher the number the darker the shade. All shades with the end number 5 have cool undertones (pink, rose shades), the 0 numbers are for warm undertones (yellow/ golden), while the neutral shades end with a 25. You can get it for 36,00€ on urbandecay.com. According to Urban Decay, this foundation is waterproof, long-lasting, highly pigmented, therefore, provides full coverage with just one layer, delivers a flawless looking complexion with a matte finish, has a light diffusing effect of blurring out flaws, is paraben-free as well as oil-free, mattifies and absorbs oil to reduce the appearance of shine. The foundation has a creamy consistency and is so highly pigmented, that one pump is enough to cover my whole face. To achieve the best result Urban Decay suggests applying the product with one their foundation brushes. I apply it with a buffer brush as well as with a damp sponge. Whichever method I use the finish is always full coverage. 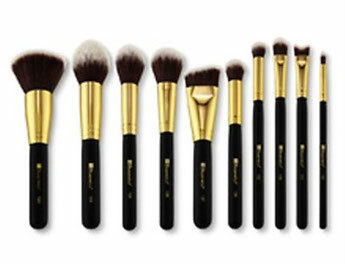 I prefer the damp sponge to achieve a slightly dewy finish instead of total matte complexion when using a brush. I have normal to combination skin. My area of concern is the nose. I have some redness around the nostrils and tend to get oily in this area. Every foundation I try must keep these problems in check. Right after the application the All Nighter Foundation has a matte but not cakey finish. After it has set, my skin appears flawless. It doesn't accentuate pores, uneven skin, or expression lines; no matter how long it's on my face. The coverage is outstanding, even the redness around my nose almost disappears. The foundation lives up to its name by lasting all day long. Sometimes I get away with zero touch-ups, for the rest, I only have to polish around my nose. As a matter of fact, it withstands my workout sessions without a problem. While applying don't go overboard, start slowly, only build up in areas that need extra coverage, otherwise, the foundation looks too heavy and unnatural. The Urban Decay All Nighter Liquid Foundation is already one of my favourites which I will repurchase in a heartbeat. You will love the All Nighter Liquid Foundation if you are looking for great coverage with an airbrushed finish that lasts all day long. In my opinion, it works best for normal to oily skin types. On dry ones, it might look cakey as it is oil-free and provides zero hydration. The Liquid Lipstick trend is still going strong and on my neverending search for the perfect liquid lipstick, I discovered GERARD COSMETICS HYDRA MATTE LIQUID LIPSTICKS. 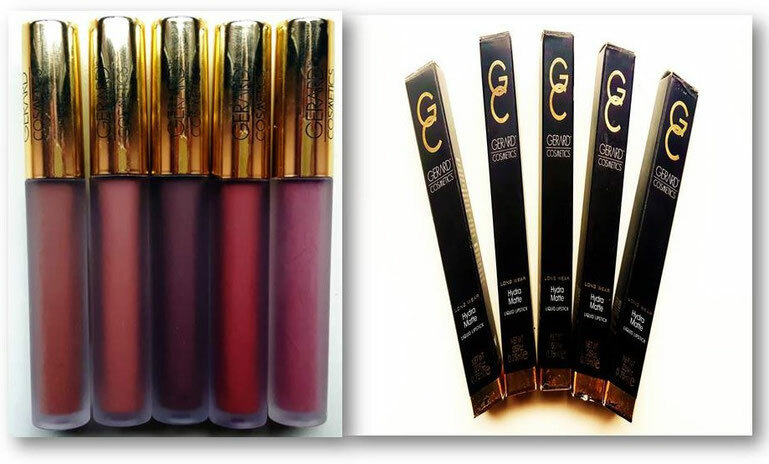 GERARD COSMETICS is a US makeup brand founded by Jennifer Gerard. Before producing a makeup line, Jennifer Gerard rose to fame with "Whitening Lightning" teeth whitening products. Arising from this success, she launched Lighted Lip Glosses and Brow Bar to Go, a brow palette to create the perfect brow. Since then, she is, slowly but constantly, extending Gerard Cosmetics product range. 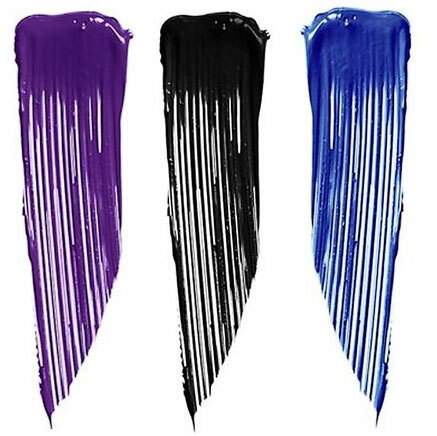 The Liquid Lipsticks come in 15 shades: Three of them are bright shades (Immortal, Mercury Rising and Summer Lovin') while the other twelve hues are taking up the current nineties lip colour trend. They more muted, with grey or neutral undertones. For all nineties lip trend lovers, like me, these twelve colours are a match made in heaven. They are all gluten- and cruelty-free. The outer package is made of black cardboard with gold/white labelling. The actual product comes in a sleek see-through container with a gold-toned lid and 1.75 g of product. According to the product description on BeautyBay, the lipsticks apply like a liquid, then dry down to a matte finish, while promising to be long-wearing and also hydrating. The product information states that the lipsticks are crafted with a special anti-flake formula, to prevent congealing, smudging or fading. I purchased five of the fifteen colours. 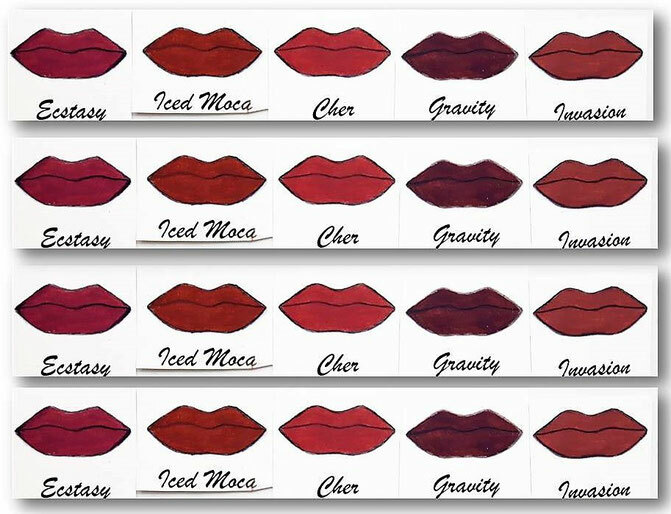 These shades are Gravity, Cher, Ecstasy, Invasion and Iced Moca. You can see colour swatches below. Due to the clear container, you can easily find your desired shade in your storage. All of the five shades have a slight chocolate/vanilla like scent to them. Personally, I like the scent, to me it isn't irritating at all. While applying, they have a creamy, velvety consistency. Due to this consistency, the colour glides on very easily. One application is enough to achieve an opaque, bold, and an even coverage. They dry down quickly to an ultra-matte finish. I wore all five shades for at least 8 hours, without using a lipliner first; I ate, drank, and even touched my lips from time to time. All of them stayed in place the whole time. I even had not to reapply the lipsticks after eating. There was no smudging or cracking up. Furthermore, I couldn't notice any significant colour fading at the end of the day. And also they lasted for ages, my lips felt hydrated the whole time. I love this Liquid Lipsticks. I have absolutely nothing to complain about. Every product claim turned out to be true. Finally, a bold lip colour doesn`t mean high maintenance, anymore. Pricewise they are in the same range as other liquid lipsticks on the market. And for me, they are worth every cent. I will definitely buy more. So, if you are into super-matte, bold, hydrating, long-lasting lipsticks, the Gerard Cosmetics Hydra Matte Liquid Lipsticks are for you. 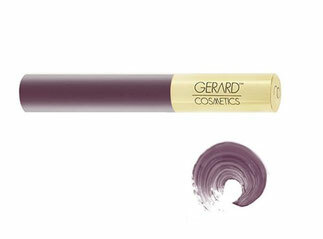 You can purchase the lipsticks on Gerard Cosmetics website or at BeautyBay. Do you know the lipsticks? This is the first post of my Beauty Product Review Series. 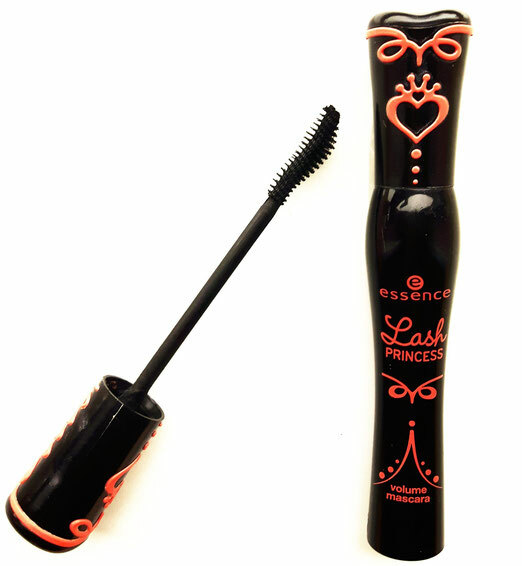 I start with a reasonably priced item the Essence's Lash Princess Volume Mascara. 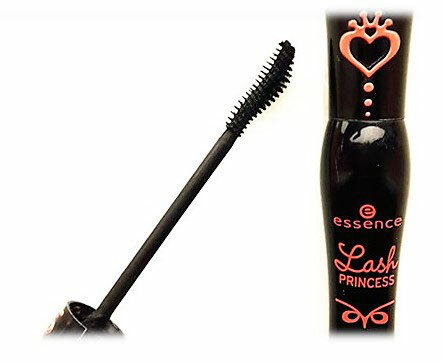 Product Promises according to Essence`s Homepage: The lash princess mascara with a specially shaped cobra-head wand covers each individual lash to create dramatic volume and a gorgeous, sweeping look; for intensive fluttering lashes. First Impression/ Packaging: I received a full sized sample of this mascara with my monthly InStyle subscription. At first sight, I wasn`t intrigued. I don`t like the packaging, which should represent an evening gown, at all. For me, the packaging cheapens the product and wouldn`t seduce me to buy it. Application/Result: The wand is slightly curved (“cobra shaped”), medium- sized, deposits just the right amount of product and with just one coat it covers all lashes, lifts them, and creates great volume. You can also layer the product to intensify the effect without getting clumpy, heavy lashes. And the icing on the cake is the really affordable price. I have repurchased this product several times for myself and to use on my clients. Verdict: BUY!!! For me, this product is a clear case of “Don’t judge a book by its cover”. The only cons are the packaging and there is no waterproof formula available.